Continuing strength in superyacht sales and new orders suggest the industry and market are in good health, while delivery and launch figures show the summer season is in full swing. Forty-five superyachts were sold on the brokerage market in June, only slightly down on May’s tally of 48 and June 2013’s 49. The largest was 79m motor yacht Pegasus V, built by Royal Denship in 2003, followed by 62m Feadship motor yacht Rasselas, built in 2005. Seven of the sales were of Taiwanese yachts, while Italy predictably comes in first with 13. 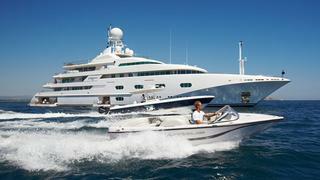 We were told of 33 superyachts coming to the brokerage market in June, up on 26 in May and June 2013. Foremost was 80.55 Project Nelson, due for launch by Burgess Marine in 2016. Another new project comes in second, the 77m motor yacht known as U77, expected to be launched by Marco in Chile in 2015. Seven of the yachts were sailers, including Claasen Jachtbouw’s 35.2m 2011 launch Firefly. We know of 10 new orders made in June, up on May’s 9 and June 2013’s 8. The largest was for a 74m CRN motor yacht due for delivery in 2016. A 61m Dutch sailing yacht is second in size, although we cannot yet report the name of the yard. Five of the yachts ordered were Taiwanese, continuing a fertile trend in this region. There were 21 superyacht launches in June, a large increase on the same month last year, when 13 hit the water, and a slight increase on May this year, when 17 were launched. June’s largest was 60m Perini Navi sailer Perseus3, followed by 54.65m ISA motor yacht Forever One. Twenty superyacht deliveries were recorded in June, up on 14 in May, but on a par with 21 in June last year. The largest to meet its owners in June 2014 was the 91.5m Oceanco motor yacht Equanimity, and next up the 81.8m Abeking & Rasmussen motor yacht Kibo and 61m CRN Saramour.